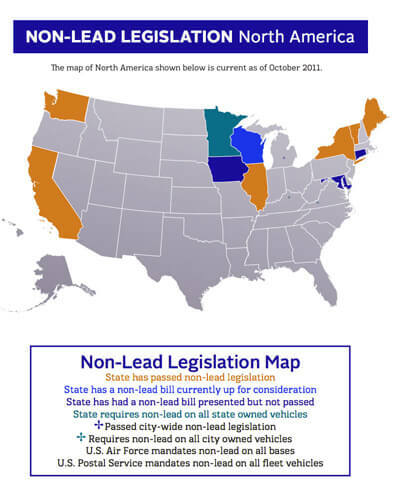 New legislation now makes it illegal to sell, manufacture or install lead wheel weights in many states. Violators can be faced with substantial penalties of up to $2,500 per day, per violation. Wheel weights made entirely of lead or zinc that end up on the roadway have high potential impacts to human health and the environment compared to steel wheel weights. Steel wheel weights are the preferred alternative due to their comparatively low toxicity and fewer environmental impacts from manufacturing. Lower environmental and human health impacts coupled with the high opportunity for steel wheel weights to be made from recycled material make steel wheel weights the best overall alternative. In California, lead wheel weights are defined by a new law, California Health and Safety Code Sections 25215.6-25215.7, as any weights containing more than 0.1 percent lead. The law took effect January 1, 2010, and applies whether wheel weights are installed on a new vehicle or removed and reinstalled during wheel balancing. Cars and trucks manufactured on or after January 1, 2010, and sold in California, must have lead-free weights. Vehicles manufactured in 2009 or before must switch to lead-free weights whenever the tires are changed or rebalanced.